We love these Reeves liquid watercolor sets. They'll last you forever, and the quality of the paint is really nice for the price. Everyone seems to have their own favorite brush, but when you're starting out, you probably don't want to spend $20 or $30 on a single brush. I like these value packs from Princeton, but no matter which you get, a good rule of thumb is to make sure the brush doesn't shed bristles as you work. 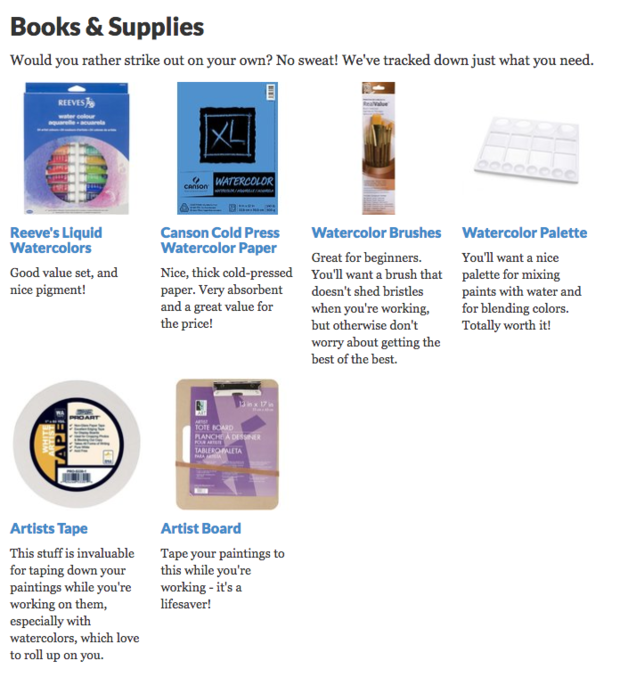 We're big fans of Canson cold-pressed watercolor paper, especially the 9"x12" size. It's a great value for nice, thick, absorbent paper, and you can get about 30 sheets for $10. Because you're getting your paper soaking wet when painting with watercolors, it has a tendency to roll up on you. Enter an artist board and artist tape. Taping your paper down will save you a lot of stress, and as an added bonus, it'll give you a neat white border all along the edge. There are tons of palettes out there, but a basic plastic one should serve you just fine as you're getting started. Painting with watercolor involves a lot of mixing and blending, so you'll appreciate having lots of little separated areas in which to do you mixing. *This post contains Amazon affiliate links; they help us pay the bills!